This past week the Republic-Times website reached its one millionth page view mark since its re-launch in the fall of 2012. The R-T would like to take this time to thank its loyal subscribers, the community, and all those that turn to the Republic-Times each and every day for their local news and headlines. 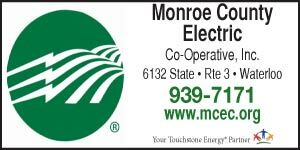 We are so blessed to have the privilege of covering Monroe County and surrounding areas since 1890. Thank you for making this such a great place to run a newspaper! Just months after the R-T rolled out its newly renovated website in 2012, it took home the award for Best Website of 2013 at the Illinois Press Association annual awards ceremony. In efforts to constantly improve itself, the Republic-Times recently updated its website again, in hopes to bring an even better user experience. The R-T is closing in on one million hits for this year and looks forward to continuing to be the community resource. The R-T always wants to provide the best service possible, if you ever have any suggestions, comments or issues with our products, please email us at news@republictimes.net or give us a call at 618-939-3814. We would love to hear from you!